AMSTERDAM, The NetherlandsSoundcraft today announced that the first installation purchaser of the company's new Vi7000 digital mixing console is the world-famous Melkweg music and arts center in Amsterdam. Already the owner of a Vi4 and Vi6 in its 700 capacity Oude Zaal (Old Room), Melkweg added a pair of Vi7000 consoles as its FOH and monitor consoles for its 1,500-person capacity Max hall. 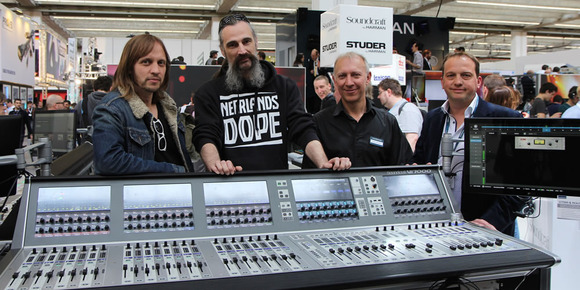 The consoles were purchased through Audio XL, Soundcraft's distributor in The Netherlands. Launched on April 15, the Soundcraft Vi7000 is an extension of the Vi6 digital console, offering optional 96kHz processing, upgraded channel counts and many more features listed below, added to the live sound industry's most popular mixing interface which also caters for dual operator use. "Most importantly, the Vi7000 sounds good," said Lenno Maaskant, First Engineer at Melkweg. "Also, we have a lot of visiting engineers and they vary from 16-year-olds who only know digital desks to veteran engineers who don't have any experience with digital. The setup of the Vi7000 is so logical that any mixing engineer will understand it right away. Everything on this desk is one-to-one translated from analog to digital and everything you need is at your fingertips." Eric Ankersmit, Sound Engineer at Melkweg, finds tremendous advantage in the console's comprehensive layout. "As a house engineer, if a visiting engineer has made an error and I need to find out the problem, I don't need to go through several menus to see what the problem is," he said. "I have a total view of the desk and that's what makes it such a great console for a music venue." Pristine sound quality is assured with ultra-low noise microphone amplifier designs and enhanced 96kHz 40-bit floating point digital audio processing, with the first ever digital implementation of the classic BSS DPR901ii Dynamic EQ adding to the channel processing armoury, while effects contain eight independent Lexicon multi-FX units, and a BSS graphic EQ on every bus output. Both consoles also feature an additional dedicated 64ch MADI interface for Realtime Rack; a collaboration with Universal Audio that gives users access to industry-standard UAD studio plugins. Rapid configuration via new encoder assign functions and shortcut keys are joined by a new extension to the Vi's patent-applied-for VM2 radio microphone status monitoring feature, with Shure ULXD systems now recognized alongside AKG's DMS800 and WMS4500 systems. "I really enjoy having all the effects at my fingertips," Maaskant noted. "Also, I can work on the outer screen on the right without interfering with the mixer who's working on the console. So if you're hosting a festival and somebody is mixing the band on stage, you can still jump on the board and set up the band that's coming on next." Soundcraft's Global Sales Director, Dom Harter added, "The highly successful Vi4 and Vi6 consoles will continue to be offered for sale and ongoing support in the same manner as the rest of the Vi Series. Additionally, existing customers can benefit from the Vi4/Vi6 upgrade package to a Vi5000/Vi7000 system details are available from local Soundcraft distributors." "It's so much convenience combined with a desk that sounds great because of the preamps and the compressors, especially now that it has the built-in BSS DPR901ii Dynamic EQ and Lexicon effects," Ankersmit added. "I'm a reverb and effects buff, so this is a no-brainer for me!" Photo Caption: (Left to right) Eric Ankersmit and Lenno Maaskant, Melkweg; Andy Brown, Soundcraft; Martin Van Kouwen, Audio XL.